My dad, for all his inherent manliness, is really a big softy. There have been lots of pearls of wisdom and advice given over the years (some that I took in and others I didn't, for better or worse), but the thing that sticks out the most in my mind right now, is actually something we talked about very recently. Everything Mark and I go through (and that I can't drive) lends to the need for lots of emotional support and physical help from friends and family. We are concerned about being a burden on people. I often don't ask for help with something when I could use it in favor of waiting until something comes up that I really, REALLY need help with, in hopes that I don't burn anyone out. Because Mark's health problems aren't acute or short-lived. Just this year, it seems we have been in constant "crisis mode". So yeah, we worry that everyone will get sick and bloody tired of us and our needs. Mark and my dad both recall a conversation the two of them had when Mark voiced this concern and my dad quite honestly confirmed that yes, indeed, it is a burden. Dad went on to explain that yeah, having to help us does place some burdens on others, but they are burdens they gladly take on because they love us. 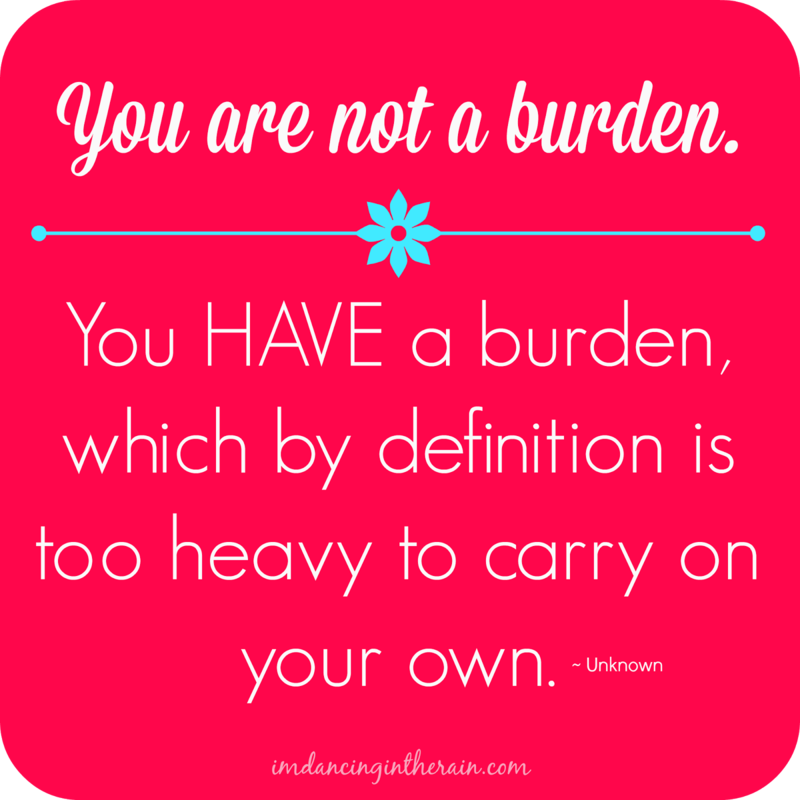 Anyone and everyone can be a "burden" on others at some point (or multiple points) in life, if you really think about it honestly. Our children are burdens, but we happily chose to bring them into the world knowing we would be responsible for taking care of them. Love, nurture and care are parts of being human. And yes, sometimes, I suppose, it's a "burden". In a later conversation between me and my dad, he brought the first talk with Mark up and elaborated further. He said something that I appreciated so very much and will never forget. Dad explained to me that it's the love between Mark and I that inspires and motivates others to be there for us. Everyone can tell that I don't simply feel obligated to Mark because I married him. It's obvious that I love him very much, and he loves me too. Knowing that people really SEE that, is very important to me. And to receive that validation was awesome.